One of Credit Suisse's three focus themes in corporate citizenship is education. We view education as an effective tool for delivering positive and lasting economic and social impacts. 10 years ago, Credit Suisse launched the Global Education Initiative (GEI). Together with selected not-for-profit organizations across the globe, the GEI aims to increase girls' financial capability and awareness of their social and economic rights, and to help them build better futures for themselves. Kofi Annan, the seventh Secretary-General of the United Nations, once said: "Knowledge is power. Information is liberating. Education is the premise of progress, in every society, in every family." Yet the world's poorest children are still highly likely to be excluded from education – and of these, girls are even more likely to be disadvantaged: 130 million girls are not in education, 15 million are expected to never enroll at all. Girls are 1.5 times more likely than boys to be completely excluded from primary education, and at the end of 2015 fewer than half of all countries had achieved gender parity in education at secondary level. Due to a combination of factors, many girls are forced to leave school while others never have the opportunity to go in the first place. That's something worth remembering, especially today, on International Day of the Girl Child. This year marks the 10th anniversary of our two global initiatives (in Financial Inclusion as well as Education), and Credit Suisse is more than ever dedicated to continuing to work on educational challenges and supporting our partners. Over the first five years, the GEI targeted school-aged children in selected countries, developing strong partnerships with selected global not-for-profit organizations. In 2014, the GEI decided to refocus the initiative towards Financial Education for Girls. This signature program teaches adolescent girls about their rights and responsibilities, saving and spending, planning and budgeting, as well as starting their own mini social and financial enterprises. By increasing girls' financial capability and awareness of their social and economic rights, the program helps girls in low-income countries build better futures for themselves. Phase 1 of the Financial Education for Girls program was implemented by Plan International and in 2017 Room to Read joined the program to commence Phase 2. Aflatoun International provides technical expertise and support to partners working in Brazil, China, India, Rwanda, Tanzania, and Sri Lanka. Through the Financial Education for Girls program, the GEI addresses two of the United Nations' 17 Sustainable Development Goals (SDGs) (ratified on January 1, 2016): Quality Education and Gender Equality, goals number 4 and 5 respectively. Goal 4 focuses on the acquisition of basic and higher-level skills, greater and more equitable access to technical and vocational education and training as well as higher education, lifelong training, and the knowledge, skills, and values needed to function well and contribute to society. Goal 5 aims to empower women and girls to reach their full potential, which requires eliminating all forms of discrimination and violence against them, including harmful practices. It seeks to ensure that they have every opportunity for sexual and reproductive health and reproductive rights, receive due recognition for their unpaid work, have full access to productive resources, and enjoy equal participation with men in political, economic, and public life. To achieve these ambitious goals, public and private sectors must work hand in hand. For example, earlier this month Room to Read provided an opportunity for Credit Suisse to partner by joining Goalkeepers ‒ a multi-year campaign dedicated to accelerating progress towards the SDGs that was established by the Bill & Melinda Gates Foundation. Room to Read and Credit Suisse aim to accelerate early literacy and implement systemic change in the education system across India. By providing quality educating to all children across the globe, we are shaping our own future. Today's kids will build the world of tomorrow, and we need to make sure they are all well-equipped to do that. 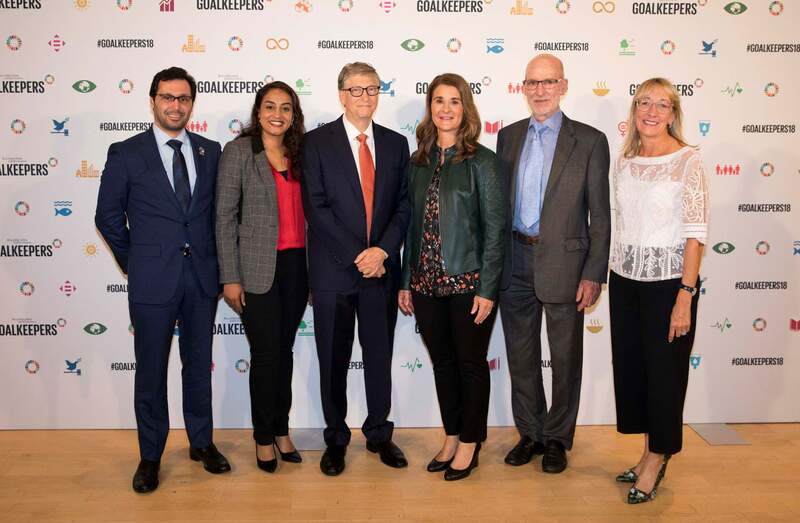 Bill & Melinda Gates Foundation: Goalkeepers 2018. From left: Tariq Al Garg (Dubai Cares, CEO), Dr Geetha Murali (CEO Room to Read); Bill Gates; Melissa Gates; John Bothamley (Four Acre Trust), Marisa Drew, CEO Impact Advisory and Finance Credit Suisse. Aflatoun International's partnership with Credit Suisse has strengthened the charity's capacity to engage in corporate-NGO partnerships. Partnering with the two international not-for-profit organizations delivering Credit Suisse's financial literacy and life skills program inspired the development of Aflatoun's new product Aflateen+, which offers a specialized approach to girls' financial education. Plan International's long-term partnership with Credit Suisse – aside from benefitting over 200,000 children ‒ has also strengthened Plan International as an organization, both in how it partners the private sector, and through building the skills and experience of its staff around the world via the Credit Suisse Global Citizens Program (GCP). From project management training and consultation on communications, human resources and leadership, to workshop facilitation and information technology, 29 Credit Suisse employees have helped strengthen Plan International's capabilities across 15 Plan International offices. Room to Read's partnership with Credit Suisse began in 2005 and reached over 138,000 children through funding libraries, schools, and literacy programs. Credit Suisse GCP volunteers have carried out assignments in all of Room to Read's country offices. Joining the Financial Education for Girls program in 2018 provided Room to Read with the opportunity to collaborate with both Plan International and Aflatoun International, resulting in a cross-organizational exchange of knowledge and expertise. Teach for All is also a long-standing Credit Suisse partner: The bank has been a founding supporter of Teach for All's work since 2009, and our support has contributed to the not-for-profit's ability to expand from 9 organizations in 2009 to 48 network partners today. Most recently, to align with the Global Education Initiative's gender focus, Credit Suisse began supporting Teach for All's Global Girls Education Initiative, which fosters teaching strategies that are supportive of girls. As with our other partners, organizations in the Teach for All network find the support of our GCP volunteers invaluable as they aim to grow their social enterprises rapidly and effectively.